Interested in learning more about birthstones? Especially, the birthstones for the month of June. Find all the information you need to know to about these delightful gems right here. Since all of them have special meanings for the months they are designated for. What is a birthstone? Where do birthstones come from? What is the birthstone for my month? Let’s start by answering these questions. Then, focus on June Birthstones. The three exquisite gemstones designated for people born in June. Let’s begin! Simply put, birthstones are gemstones that represent a person’s birth month. Each month has a unique gem (sometimes more than one) associated with it. The gem usually holds a special meaning for those born in that month. Each birthstone has a distinct beauty that creates a captivating appearance on a piece of jewelry. In fact, this is how they’re most commonly worn. Birthstones are not only worn during the specific month they’re associated with. Instead, you can enjoy their beauty throughout the whole year. Often, these gems are given as a gift to someone on their birthday. That’s not only because of their beauty but the meaning behind them too. The Mohs Hardness Scale was developed in 1812 by Friedrich Mohs. He was a German mineralogist. In the scale, hardness defines the mineral’s resistance to being scratched. A hardness grade of “10” signifies that a mineral is very scratch-resistant. Meanwhile, a “1” grade suggests the mineral is very prone to scratches. A mineral gets scratches when an external object breaks its chemical bonds. The test is usually conducted by checking whether one sample of a mineral is able to visibly scratch another. The scale is ordinal. Thus, even though a diamond is four times harder than a topaz, their scores are 10 and 9, respectively. Despite being more than 200 years old, the scale is still widely used by geologists today. Throughout their history, birthstones have been associated with folklore. They detail various symbolic powers and qualities, just like zodiac signs. The belief is that by wearing your birthstone, you connect to the qualities it represents. Nowadays, many do not believe the mythical healing powers of the birthstones. But, their symbolic meaning is still valued. More generally, birthstones are considered to be a token of good fortune for those born in the month. Fact: Though there are over 200 naturally occurring gemstones, only 19 of them are officially listed as birthstones. Birthstones have been significant since ancient times. Also, their history is fascinating. To get started, we cover one extremely common question that many people have. How did the idea of birthstones first originate? The idea of birthstones has its roots in Biblical times. 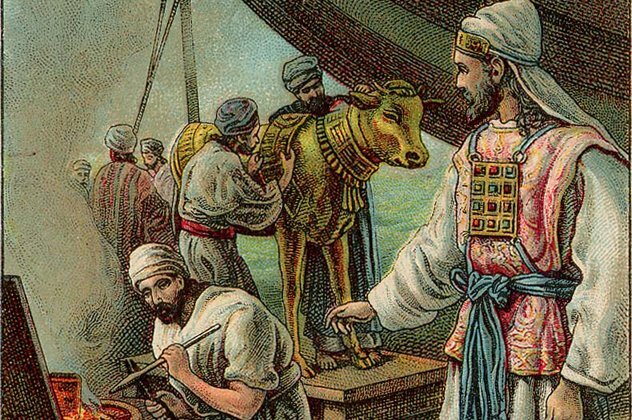 As written in the Bible, in the book of Exodus, Moses describes the ceremonial priest’s garment. It was to be made for his older brother Aaron, a high priest. He gives directions to adorn the breastplate with twelve different gemstones. Thus, each symbolizing one of the twelve tribes of Israel. Titus Flavius Josephus was a first-century Romano-Jewish historian. He was the first to make a connection between the twelve gemstones and the twelve zodiac signs. Later, the twelve months of the Roman calendar. For centuries, the standard practice was to have all twelve gemstones and wear them each month. Then, custom changed. Instead, only the gemstone of the month you were born had to be worn throughout the year. As to which specific gemstones were initially used as part of the twelve remains a highly debated topic. Not only are there are differences in information in various versions of the Bible, but it’s also very difficult to interpret. This is mostlydue to the fact that there was very little understanding of minerals during Biblical times. Thus, the descriptions were often inaccurate. Many combinations of birthstones were used until 1912. Later, the American National Jewelers’ Association, put together the first official list. Though this list has little connection to the original set of gemstones described in the Bible, it is regarded as the most authoritative source. Since 1912, there have been a few updates to the list. Specifically, about June birthstones. In the original list, pearl and moonstone were listed as the only birthstones for the month of June. In 1952, nearly a century after first being discovered, alexandrite was also added to the list. Thus, those born in June have three stunning gemstones to choose from. We will take a closer look at each of them in the next section. 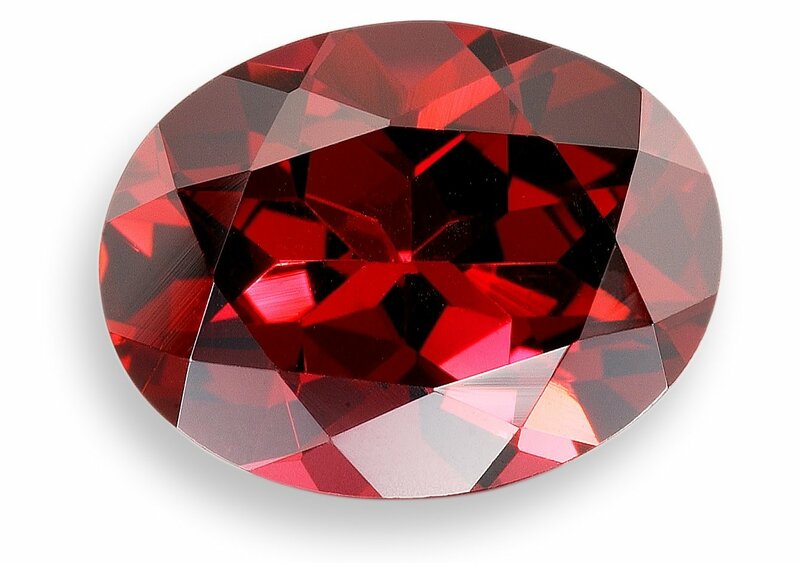 These alluring gemstones are most famous for rich red hues. However, they come in many other colors including orange, green, and even purple. Each of these colors represents a specific variety of garnet. That’s the reason why the minerals are called that way too. There are six members of the garnet family: pyrope, almandine, spessartine, andradite, grossular, and uvarovite. They are each found in a different country. Anywhere from the United States (pyrope) to Siberia (grossular). The vivid red and pink shades of the pyrope are a result of the chromium and vanadium traces. Meanwhile, the more purplish-red hues in almandine come from iron. The yellow and orange shades that spessartines are known for are because of manganese. The name comes from the Latin word granatum which translates to “seedlike.” It’s a reference to pomegranate (pomum granatum) seeds which the gemstone resembles. Garnets have been found in ancient Egyptian tombs that date back 5,000 years. That only shows a longstanding connection people have had with these gems. For those born in January, this birthstone brings peace, good fortune, and long-lasting friendship. FACT: In addition to being the January birthstone, the Garnet is also the state gemstone for New York, Connecticut, and Idaho. February babies have Amethyst as their birthstone. This gem protects those born in the month from negative energy. The palette of the gemstones features breathtaking shades of purple ranging from light lavender to violet. Due to its color, ancient Greeks associated the gem with Bacchus, and believed that it protected against intoxication. The name actually comes from the Greek amethystos, meaning “not intoxicating.” Today, most of the amethyst supply comes from South American countries such as Brazil and Uruguay. But, also from Sri Linka, Siberia, Canada, and the United States. 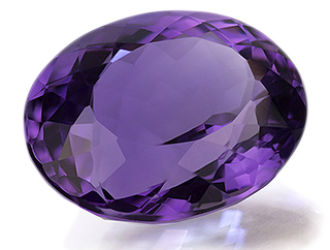 The gemstone gets its violet color primarily from iron impurities. But, some scientists argue that exposure to natural radiation can also have an effect. FACT: Amethyst is the rarest gemstone in the Quartz family and is the traditional gift for 4th, 6th, and 17th wedding anniversaries. 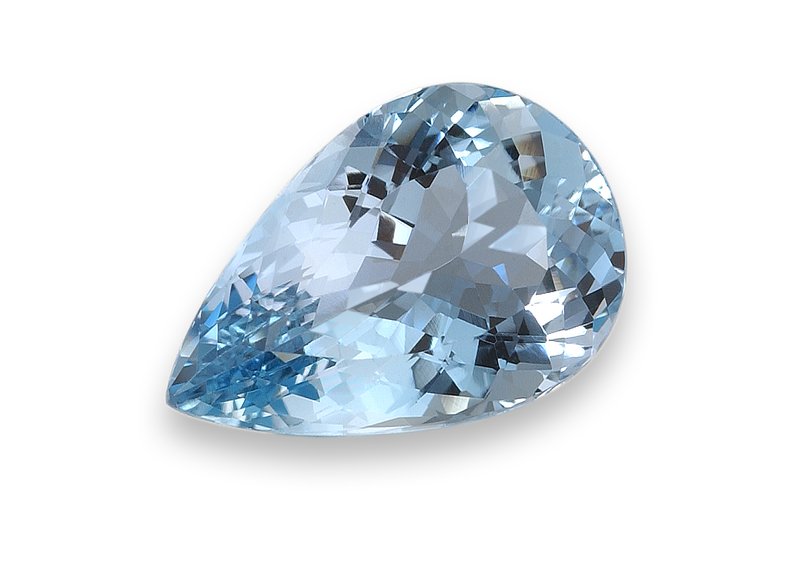 Aquamarine is a gemstone that comes from the same beryl family as emeralds. The name originates from the Latin words aqua and marina. Together they translate to “sea water” and represent the stone’s color. The tranquility of the stone invoked by its light blue shades holds significance in its meaning. It’s is believed to protect sailors against rough seas, as well as soldiers going into battle. Today, people believe that the gemstone to helps to ensure safe travels. Aquamarine comes from Brazil, as well as the United States. In fact, it’s the official stone for the state of Colorado. Like amethyst, aquamarine owes its light blue color to the presence of iron. FACT: The Dom Pedro Aquamarine is the largest aquamarine in the world, measuring nearly 24 inches tall and weighing an astounding 60 pounds. As the world’s most popular gemstone, diamonds are treasured all over the globe. In fact, they have been for thousands of years. Ancient Romans and Greeks believed that the gemstones were made of tears of the gods. Though white diamonds are most common, more rare varieties include black, yellow, red, and blue. They are the hardest gemstoneof all, over 50 times harder than anything else found in nature. Diamonds are a symbol of purity and everlasting love. Thus, it’s a perfect gift for someone special in your life that’s born in April. Diamonds come from many different countries. Some of the largest exports are Botswana, the Democratic Republic of Congo, Canada, and Russia. The gems that are chemically and structurally perfect are naturally colorless. Colored diamonds, on the other hand, are a result of chemical impurities and structural imperfections. A few examples: boron in the crystal matrix (blue diamonds) or deformation of the crystal lattice due to heat and pressure (pink and red diamonds). 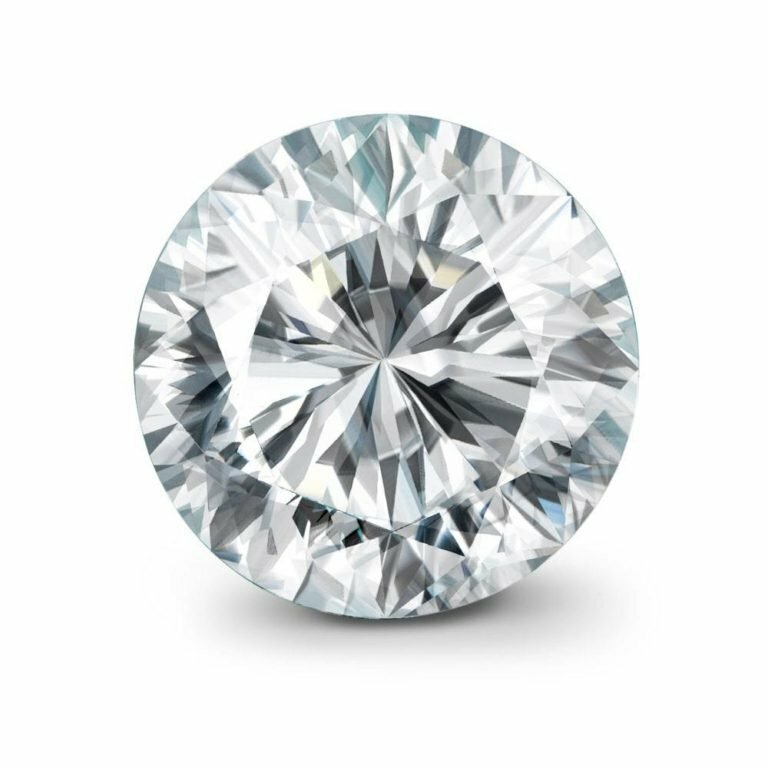 FACT: According to the World Diamond Council, an estimated $13 billion worth of rough diamonds are produced each year throughout the world. 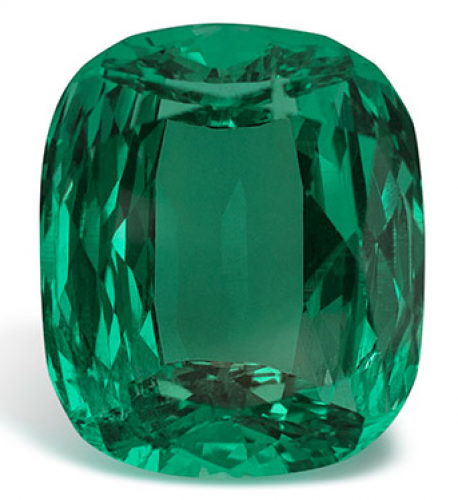 Emerald is the designated birthstone for May. The vibrant green hues of the gemstone exude a Springtime aura that’s a perfect fit for those born in the month. Because they’ve been treasured for thousands of years, there are many interpretations for their meaning. Today, emeralds are symbols of passion and a zest for life. They come from different South American and African countries. Some of these include Brazil, Colombia, Zambia, and Zimbabwe. Gems in the beryl family are naturally colorless. But, chromium impurities give the gemstone its famous green color. FACT: In 2017, the famous 18.04 carat Rockefeller Emerald sold at auction for $5.5 million, making it the most expensive emerald ever (per carat) sold at $305,000 per carat. June has three birthstones, all of which are beautiful in their own way. They also offer their own symbolic meaning. 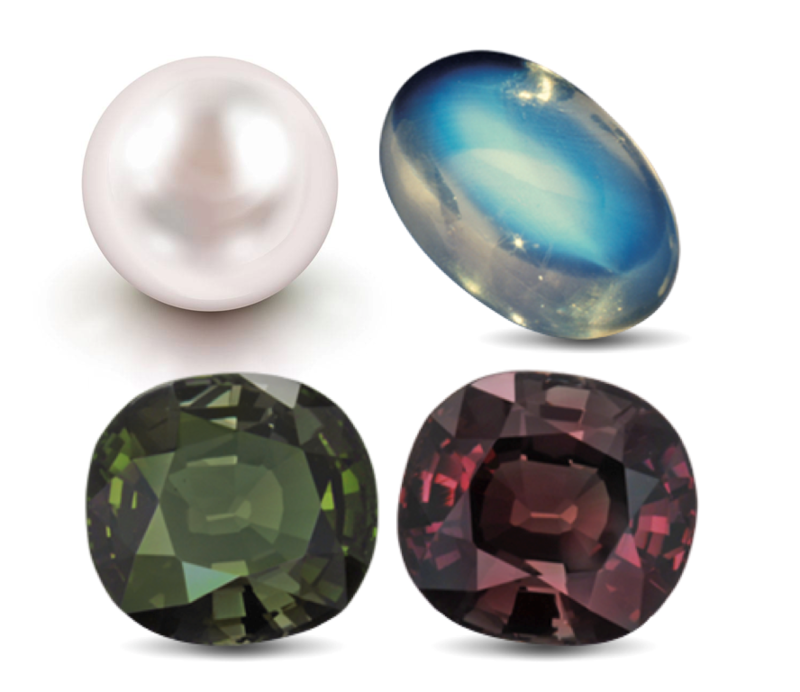 Pearls and moonstones have a long history linked to them, while Alexandrite is a more recently discovered gem. In fact, it has begun to get more attention in the past couple of decades. Each gemstone comes from various locations across the globe. Pearls can come from waters in China, Japan, Australia, the Philippines, and French Polynesia. Alexandrite, on the other hand, has always been exclusive to the mountains of Russia. However, a large deposit got discovered in Brazil. The United States, Brazil, and India are some of the largest exporters of moonstones. White pearls feature a traditional and elegant appeal. 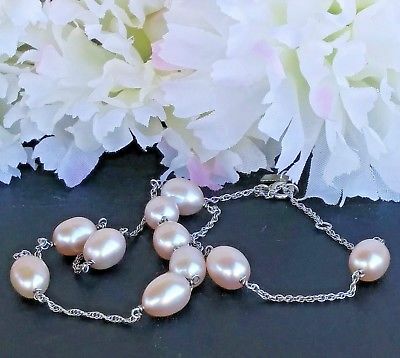 Pink pearls have a feminine and chic aesthetic. Multi-colored pearls offer a unique and modern look. Layer different colored freshwater pearl jewelry to create a dazzling look that can add style and sophistication to any outfit. The color of pearls depends on the color of the outer shell of the mollusk. Alexandrite features a color-changing property (that we will cover later on). It’s a result of chromium traces in the mineral. Moonstone consists of orthoclase, and albite. They are stacked in alternating layers. This causes the adularescence which gives the gem its unique appearance. We describe each of these three June birthstones in-depth in the next section. FACT: In 2012, scientists discovered a pearl in the United Arab Emirates that is believed to have originated between 5547 and 5235 BC, making it the oldest pearl ever found at nearly 7,500 years old. Often referred to as the “King of Gems,” the ruby is the July birthstone. These gemstones feature a fiery red color that has made them one of the most recognized gems in the world. They symbolize qualities such as love, power, protection, and good fortune. For a long period of time, spanning hundreds of years, Burma was the only place in the world where rubies were found. Today, rubies are all over the world. When an aluminum atom gets replaced by a chromium atom in the naturally colorless corundum mineral, it results in the rich red hues. Rubies have become revered for them. Fact: The world’s most famous ruby is widely considered the Sunrise Ruby, which is a cushion-cut Burmese ruby weighing in at 25.59 carats. In 2015, it was purchased for a whopping $30 million. There are two awe-inspiring gemstones associated with August: peridot and spinel. Peridot – prized for its distinctive lime green color that reflects under the light. Spinel, on the other hand, comes in a wide variety of elegant colors. As far as symbolic meaning, peridots bring prosperity. Spinel represents longevity. Most peridots available on the market come from China, Pakistan, or the United States. 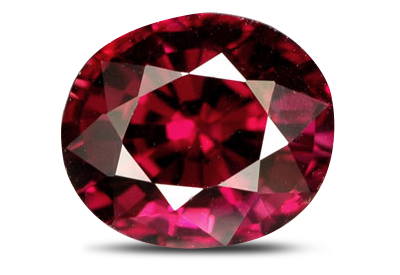 However, Spinel comes from a host of countries, mainly in Central Asia and Africa. Peridot’s color depends on the percentage of iron that the mineral withholds. It can make the gem range from yellow and light green all the way to brown. Pure spinel is colorless. But, various chemical impurities fill it with an array of colors. FACT: In 2016, spinel became the most recent addition to the list of official gemstones when the Jewelers of America and American Gem Trade Association designated as one of August’s gemstones. The radiant blue color of sapphires is chosen for the month of September. Despite their trademark blue hue, they also come in different colors such as pink and orange. These gems have played an important role in many historical cultures. Thus, they held many different meanings. Today, sapphires are a symbol of truth, genuineness, and nobility. The largest deposits of sapphire are in Central and South East Asia, as well as Africa. Sapphires are a part of the same corundum family as rubies. 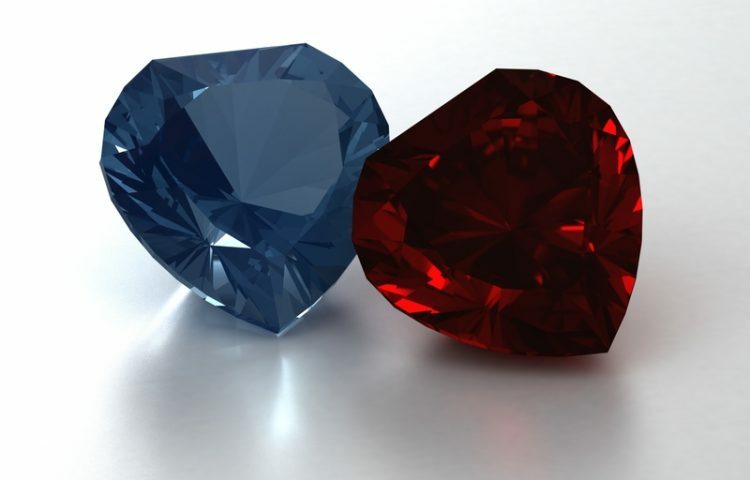 Similar to rubies, they get their colors from impurities. 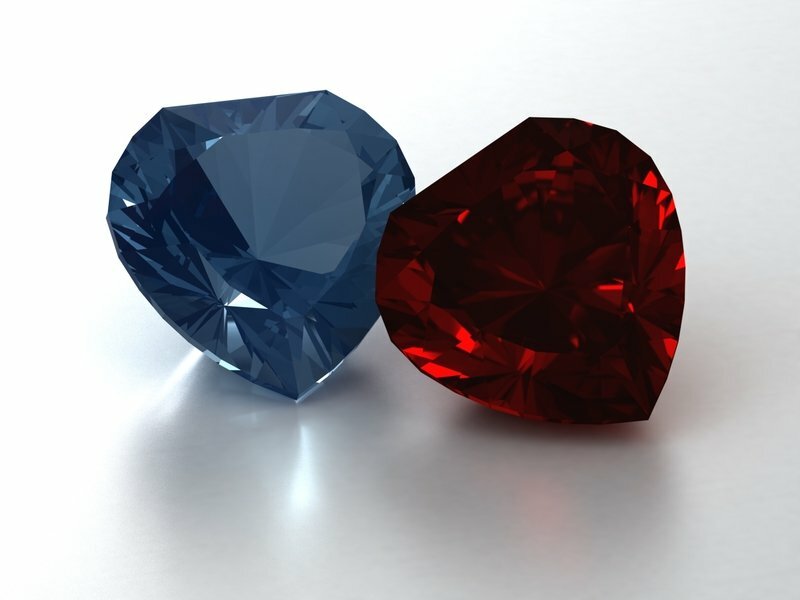 For blue sapphire, these are iron and titanium impurities. If only iron is present then the gem becomes flat yellow. But, if only titanium is present, the mineral stays colorless. If both metals are present, a process known as charge transfer takes place. It changes the energy levels and produces the blue coloration. Tourmaline and opal are both the birthstones for the month of October. While tourmaline may not be one of the most recognized gemstones, there is no doubt that it is unique. One reason is that they feature the largest assortment of colors out of all gemstones. The belief is that the gemstone possesses an inward energy which calms you down. Opals also posses many colors creating a truly enticing display of beauty. The colors of the gemstone enhance creativity. In the end, it’s safe to say that both gems are prime examples of nature’s beauty. Tourmaline is found all over the world, and its color typically depends on where it comes from. In contrast, 90% of the world’s opals come exclusively from one country: Australia. Tourmaline is composed a boron-silicate mineral. It’s made out of aluminum, iron, magnesium, sodium, lithium or potassium. Tourmalines that feature bright colors such as pink, red, green, blue, and yellow are rich in lithium. Less-desirable black and brown tourmalines are rich in iron or magnesium. Opals reflect nearly every color of the rainbow. This is due to one primary factor: diffraction of light. Opals diffract white light, splitting it as it enters from above. Then, reflects it on the top of the stone in all the colors of the spectrum. FACT: In 2015, scientists from the Glasgow University who were studying a meteorite from Mars found traces of opal, leading them to believe that the planet was once thriving with life. November claims two charming birthstones in citrine and topaz. Citrine is quite a rare gemstone and features a striking yellow color which is indicative of its name. The gem has been associated with positive energy and optimism. Topaz has long been a favorite of jewelry collectors. Among some of its most popular colors are purple, pink, blue, and red. The gem is symbolic of faithfulness and loyalty, especially in friendship. Most of the world’s citrine supply comes from Brazil. Topaz comes from there too. But, many other countries including Russia, Germany, Mexico, and the United States have it. Citrine is another member of the quartz family, which also includes amethyst. Today, naturally colored citrine is extremely rare. As a result, most citrine is in fact amethyst that has been heat-treated to get its yellow color. Structurally perfect topaz features a color that ranges from yellow to brown. Impurities of chromium and iron give the stone the different colors mentioned above. FACT: It is virtually impossible to differentiate between an orange-yellow topaz and the same colored citrine with a simple eye-test, even though they are part of different mineral families. After tanzanite was added to the list of December birthstones in 2002. Thus, the month became the second one to feature three gemstones. All three of these gemstones come in different varieties of blue—a perfect complement to the cold winter month. While they might share a common color, their meanings are quite different. Turquoise is a protective amulet, while zircon is symbolic of high energy. Lastly, tanzanite represents truth and dignity. Zircon comes mainly from four countries: Sri Lanka, Cambodia, Burma, and Australia. Tanzanite is from Tanzania. Lastly, Turquoise deposits are in the United States, Iran, China, Chile, and Tibet. 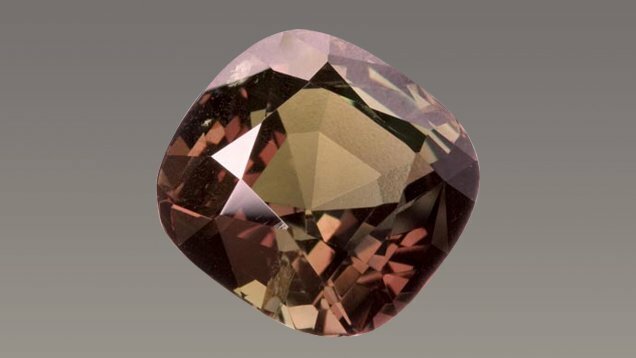 Most zircon gemstones feature a brown color. But, color centers can form naturally if the trace elements are present. That gives zircon colors such as blue, green, and even gray. Tanzanite is typically found having a brown hue. However, heat treatments can “remove” this brown color to show its breathtaking violet. Turquoise is a mineral that consists of copper aluminum phosphate. The copper is the cause of its blue color. When the mineral contains traces of iron, it gets a green accent. FACT: It wasn’t until 1967 that tanzanite was discovered along the foothills of Mount Kilimanjaro, making it one of the more recent gemstones to be discovered. In 2002, it was added to the official list of December birthstones. June is one of the two months that has three birthstones. Pearls are thought of as the primary birthstone for the month. On the other hand, moonstone and alexandrite are considered alternative June gemstones. All three are remarkable gemstones with distinct histories, colors, shapes, and meanings. Pearls are undoubtedly one of the earth’s most unique gemstones. They are the only gemstones to come from a living creature. These include mollusks such as oysters. Also, clams that come from specific oceans and rivers located in different parts of the world. Today, pearls are one of the most popular gemstones. There are various interpretations as far as what the meaning of pearls is. That’s mainly because so many different cultures treasured and embraced the gem. Historically, pearls were associated with water because of where they originate from. But, also with the moon because of their look. In ancient Chinese culture, people believed that pearls brought wisdom. Today, pearls are most commonly believed to symbolize purity, integrity, and love. This belief comes from the ancient Greeks. They thought that pearls were Aphrodite’s hardened tears of joy. She is the ancient Greek goddess of love and beauty. As the primary birthstone for the month of June, pearl jewelry makes a great gift for anyone born in the month. Featuring unique designs that are strung with gold, tin cup pearl jewelry is one of our favorite gift choices. Not only are the tin cup designs delightful and fun, but by incorporating the pearl birthstones, the gift is also extremely thoughtful. People have treasured pearls since ancient times. In both ancient Egypt and Rome, royalty adorned themselves with the dazzling gemstone. Due to the extreme rarity and high value, they were symbols of power, class, and prestige. Though pearls continue to maintain very high levels of popularity today, they’re not the exorbitantly priced gems they once were. For thousands of years, all pearls were natural. That means that they developed in nature entirely on their own. Divers would risk their lives to dive deep into waters and collect mollusks. That’s despite the slim chances of actually finding a pearl. 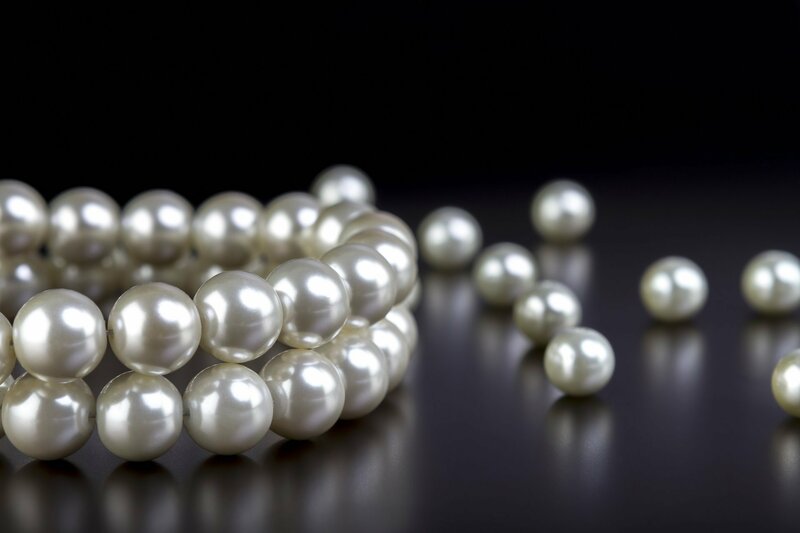 Given their extreme rarity, natural pearls were and still continue to be expensive. Nearly all natural pearls available on the market today are vintage pieces. This is primarily due to one development which changed the pearl industry forever. In 1893, Kokichi Mikimoto developed the world’s first cultured, or farmed, pearl. These cultured pearls featured the same qualities as natural pearls. Also, they had more spherical shapes that people preferred. In the years that followed, the supply of pearls increased dramatically. That lowered the price of the gems making them accessible by many more people. Cultured pearls were also a much more sustainable option than natural pearls. That’s because the population of wild mollusks was severely depleted by that point due to overharvesting. Today, nearly all pearls available for purchase today are cultured. 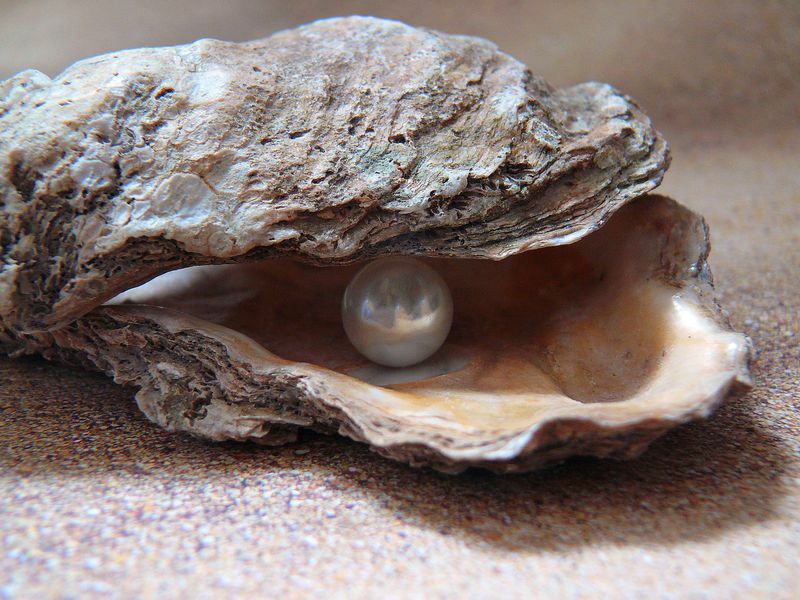 In nature, pearls develop when a tiny particle gets trapped inside a mollusk completely by chance. To defend itself from this irritant, the mollusk begins to produce and coat the particle with nacre. It’s a composite made largely from aragonite that gives pearls their luster. In essence, this particle acts as the nucleus of the pearl. As the mollusk continues to coat the particle with nacre, a pearl slowly begins to form. It can take up to four years for a pearl to fully develop. For cultured pearls, there is one significant difference in this development. It is how the particle is first introduced. Instead of this process happening randomly, pearl farmers deliberately insert it. From there, the process is exactly the same as for the natural pearl. Pearls come in a variety of exquisite colors that are all unique in their own way. Although white is most commonly associated with the gemstone, they are also available in other colors. That includes black, pink, and even a golden hue. And while perfectly round pearls are most popular, the gemstones also feature different shapes. Some of these are baroque, semi-baroque, and drop-shaped. Although baroque and semi-baroque shapes are slightly irregular, they give the gemstone a one-of-a-kind aesthetic. And more people are coming to appreciate them. While color and shape are both important qualities of a pearl, many would say that a pearl’s luster is its defining characteristic. As mentioned before, this luster comes from the quality of the nacre that a mollusk uses to create the pearl. The luster is the reason why the gemstone reflects the light in such a way as though if it’s glowing from the inside. The color, shape, and luster-quality of a pearl all depend on the type of pearl, which we discuss in the next section. There are four pearl types: Freshwater, Akoya, Handama, Tahitian, and South Sea. Each features distinct characteristics that vary in the qualities we discussed above. Also, in size and value. Additionally, they all come from different geographic locations. Freshwater Pearls: Found in lakes and rivers in China. Freshwater pearls are one of the most popular types of pearls. This is because of their reasonable price-points. Despite their affordability, they maintain a high level of quality. Especially in recent years with advances in Freshwater pearl cultivation. From white to pink, cream, and lavender, Freshwater pearls come in a wide variety of stunning colors. Akoya Pearls: Japanese Akoya pearls were one of the first types of pearls to get cultivated. They have since become a distinguished pearl type revered around the world. Not only do they feature perfectly spherical shapes, but also very high luster. A white Akoya pearl necklace is considered one of the most classic and timeless pieces of jewelry that money can buy. Tahitian Pearls: Despite their name, Tahitian pearls don’t only come from Tahiti. Instead, you can find them on the coast of many islands that make up French Polynesia. These pearls are unlike any other. And this is primarily due to their breathtaking colors. Most notable is their irresistible black hue. But, others include a peacock green, silver blue, and eggplant. South Sea Pearls: There are two variations of South Sea pearls: white and golden. White South Sea pearls are found on the coast of Australia. Meanwhile, Golden South Sea pearls come from the Philippines. 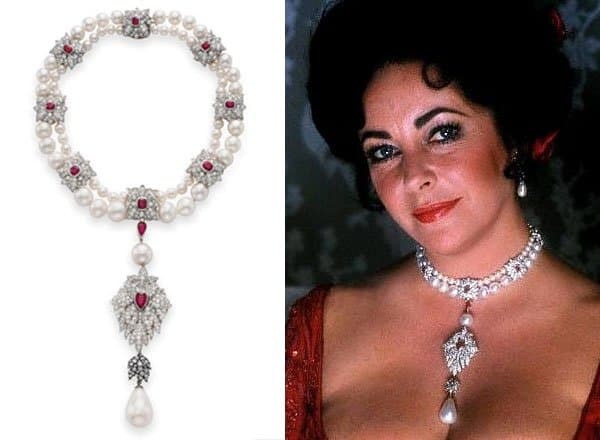 Both feature pearls that are larger than any of the other types. They’re perfect for someone looking for a set of bold, lavish pearls. What is the perfect piece of jewelry? They need to be able to take any outfit to the next level, and work with a variety of different colors and styles. Pearl necklaces do just that. As one of the most iconic pieces of jewelry, they provide the perfect touch of class, refinement, and shine. There’s no doubt a pearl necklace is something every woman should have in their jewelry box. Moonstone, an incredibly luminous gemstone. It’s the second birthstone for the month of June. Though they are not quite as popular as pearls, many would argue that they’re just as beautiful. Moonstones come from the feldspar mineral group, which makes up a good portion of the earth’s crust. As a result, there are many different geographical locations where they’re found. That includes the United States, Brazil, India, and Armenia, to name a few. They’ve been adorned by people for thousands of years. The stone has been prevalent in ancient Roman, Greek, and Hindu cultures. These gems were especially particular during the Art Nouveau era between 1890 and 1910. Jewelers in this period made frequent use of the gemstone to decorate jewelry. 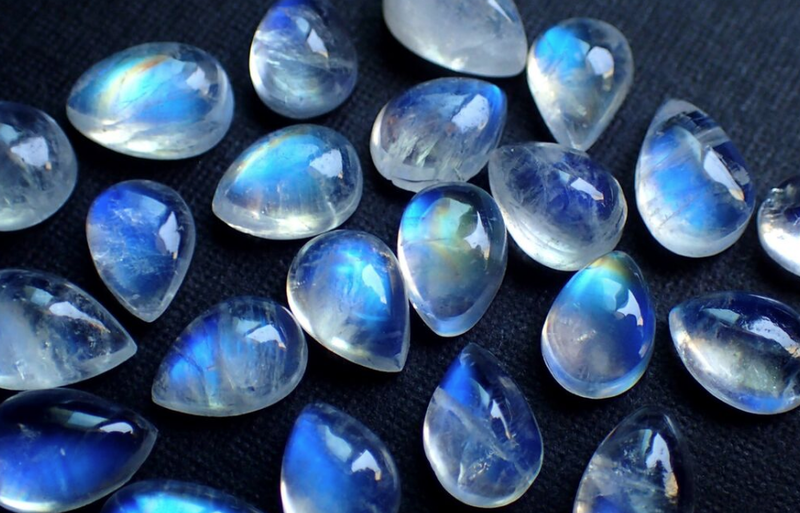 The most striking quality of moonstones is their adularescence, or schiller, as it’s often referred to as. As light strikes a moonstone, the internal structure of the gem makes the light scatter. It gives the same visual effect as when clouds are lit up by the moon. This is where the name of the moonstone originates from. In fact, in many ancient cultures, the gemstone was thought to had been created from moonbeams. The serene beauty of this gemstone is where its meaning comes from. Especially the soothing aesthetic of the moon. Historically, the gem has been a talisman for the soul and spirit. Moonstones have a feminine energy that brings inner-peace, tranquility, and balance. The captivating appearance of the gem is indicative of this symbolism. Thus, making it easy to understand and embrace its meaning. 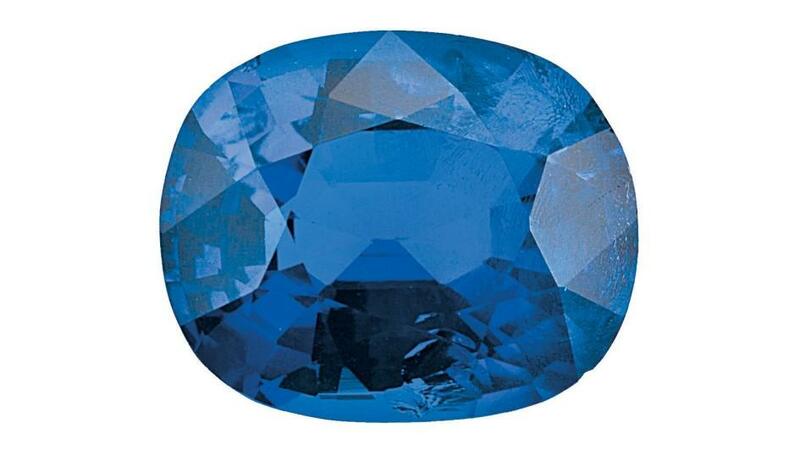 The third of the June birthstones was discovered in 1830 by Finnish mineralogist Nils Gustaf Nordenskiöld. He initially believed that the gemstone was emerald. However, two distinguishing factors made him realize that he had found a new gem. One was that this stone was a lot harder than emeralds. Next was the way the stone changed color under light. It was originally named diaphanite by Nordenskiöld. But, it didn’t last long. The stone came from Russia’s Ural Mountains—the only place in the world it was found at the time. With sole access to this gemstone, Russia’s royalty stepped in and named the newly discovered gem Alexandrite. It’s after the country’s future leader, Tsar Alexander II. When Alexandrite was added to the list of June birthstones in 1952, Russia was still the only place of source. And by that point, the supply was extremely depleted. It wasn’t until thirty years later when other deposits of Alexandrite were found in India, Burma, and Brazil. Despite this new supply, Alexandrite is still considered extremely rare. Thus, it is one of the world’s most expensive gemstones. The scientific explanation for this color-change is as follows. Under different lighting conditions, the gemstone absorbs specific wavelengths of the spectrum and reflects others. This is due to traces of chromium found in the gemstone. It results in strong absorption of yellow and green. In daylight where there is plenty of green light, the gemstone reflects this light back out. However, in artificial light, there isn’t a large source of green light. As a result, the gem instead reflects the red rays that the light source contains. Since Alexandrite doesn’t have an ancient history as the case with the other two June birthstones, there isn’t as much lore tied to it. That said, since its discovery, people have come to associate the stone with a few meanings. As a birthstone, the gem inspires creativity and the imagination. It is also symbolic of hope and optimism. Thus, reminding us that each type of light brings a new beauty to life that should never be taken for granted. Gemstones are some of the earth’s most beautiful natural treasures. Birthstones are great in that they give people a special connection to gemstones. One that goes beyond beauty and extends into symbolic meaning. If you’re born in June, consider yourself lucky to have three birthstone options that are all dazzling and embrace different meanings. With all that said, one question remains: which one will you decide on? Sos Nazaryan is a Content Specialist at the Pearls of Wisdom by The Pearl Source. One of the world’s premier retailers of high-quality pearls. Sos is always on the lookout for the latest fashion and jewelry trends that he can inform and inspire people with.